This is getting kind of ridiculous, I know. I'm not sure why it's taken me four months to tell you about a two-week trip; I can only presume that subconsciously I'm trying to hold onto the memories as long as possible or something. Either that or I'm just incredibly lazy about uploading the photos and trying to remember what happened in each of them. Yeah, probably that. But let's go with the first one anyway. 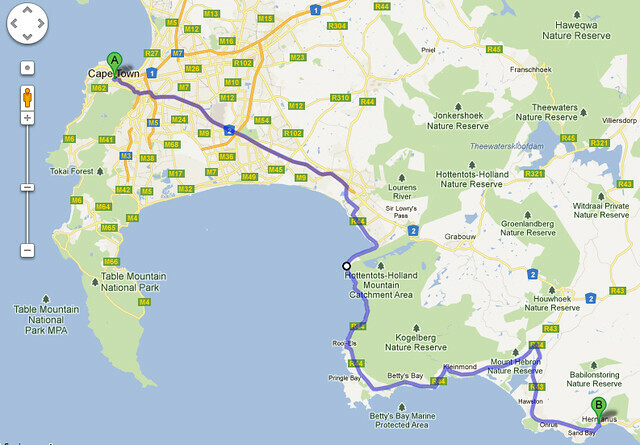 Our third foray out of Cape Town was down to Hermanus, a sweet little town about two hours south. We hopped in our trusty red rental car after lunch one day and made the journey down the coast. Now, Hermanus is lovely in its own right, but its biggest draw is the fact that it's an excellent place to spot whales—Southern Right whales to be exact, which always makes me imagine a whole bunch of whales saying y'all and voting for George Bush. The best place to spot them is from the cliff path that winds its way along the perimeter of the town, and so as soon as we'd dropped our bags at our B&B, we set off for a little wander along the cliffs. I would like to renew my vows and have my ashes scattered here, please. Although I guess I would settle for just a picnic. We wandered so far that before we knew it we'd reached the main center of Hermanus, but it was almost five o'clock by then, which seemed a good enough time to choose one of the pubs by the water and order a drink. Someone at the table next to us got some fries and they smelled so incredible in the fresh salty air, that we ordered some too on a whim. That, in a nutshell, is what I love about vacation: you want to stop for a beer? Eh, let's stop for a beer. You want to order some fries that come with a special pair of scissors for opening the little packets of ketchup and vinegar? Eh, let's order some fries that come with a special pair of scissors for opening the little packets of ketchup and vinegar. Please note that Sean is not even USING those scissors. Now, one of the things I'd been most looking forward to doing in South Africa was cage diving with great white sharks. I couldn't tell you why, but something about the experience appealed to me and I wanted to have it in my rolodex of Cool Stuff I Have Done. Since Hermanus is only about 45 minutes from Gansbaai, where the majority of shark diving trips originate, we figured we'd spend the afternoon there, then head to Gansbaai the next day. Because we were waiting to see what the weather and visibility were like, we hadn't made a reservation for cage diving, which was a little worrying to a Type A planner like me—please note that I was more worried about the lack of a reservation to dive with great white sharks than I was about the great white sharks themselves—but we needn't have fretted because the minute we mentioned this to Chuck, the host at our B&B, he phoned a few local places and got us in on a trip leaving the next morning. Wait, hold up, I think we need to talk about that B&B for a moment. Isn't it lovely? It was lovely. It was called the Cliff Cottage Bed & Breakfast, and I would highly recommend it if you're ever in Hermanus. Though we didn't get to experience the breakfast part—we left so early that we missed it, though Chuck thoughtfully put some fruit, muffins, and coffee in our room that night—the bed part was very cozy, and the location, right across from the cliff path, was perfect. The next day, we had to be down in Gansbaai by 6:45am, which meant leaving just before six. In the morning. On vacation. To voluntarily get in the ocean with sharks. I can't quite make head nor tails of that one either, but we did it anyway. Once we got to the cage diving facility—we went with a company called White Shark Adventures, by the way, who I'd recommend if you're ever thinking of doing this yourself—we signed a few forms, shakily sipped some coffee, then finally boarded the boat with the rest of our group, most of whom were very enthusiastic German boys who looked a lot braver than I felt. I'm not going to lie, I was pretty nervous. Eighty percent of that nervousness stemmed from the fact that I was about to jump, voluntarily, into shark-infested waters, but the other twenty percent came from the very real fear that I might throw up. The area around Gansbaai is renowned for its choppy waters, and pretty much every cage diving website I'd looked at had a very serious disclaimer about seasickness. While the second most awful thing I could imagine that morning was climbing into a cage to go head to head with a great white shark, the first most awful thing I could imagine was psyching myself up for the experience, then not being able to go through with it because I was sitting with my head between my knees in the bottom of the boat. As it turned out, I was fine. I dosed myself up to the gills with dramamine—actually, it was Wal-Dram II; you know, of the Southampton Drams—and stared at the horizon with an intensity that probably made the other passengers on the boat wonder if I was about to break into some Celine Dion/Titanic business. When we finally moored in the middle of the ocean—the shark-infested ocean; I'm sorry, but I just don't think that can be said enough—the crew started preparing for the experience ahead. This included pouring a whole bunch of fish guts over the side of the boat to lure the sharks in, waving benignly at a crowd of whale-watchers who stared us at us like we'd lost our minds, and asking which of us would like to be lowered into the Cage Of Imminent Death first. I knew one thing for sure; I didn't want to be in the first group of divers. I wouldn't have minded being in the second group—once I'd seen how it was all done, and also that nobody had been bloodily massacred—but as it turns out, we were in the third and final group, which gave us an uncomfortably long time to watch from the deck above and get acquainted with just how large the sharks really were. When it was our turn, we made our way down to the bottom deck of the boat, put on our masks, and lowered ourselves into the cage. Sean went first, I went next, and four of the enthusiastic German boys followed behind us. Despite the fact that we were wearing wetsuits, my immediate thought upon plunging into the water was that I was probably more likely to freeze to death than get-eaten-by-a-shark-to-death, because it was like jumping into a bowl of half-melted ice cubes. Gripping onto the overhead bars of the cage, we maneuvered ourselves along until we were all comfortably inside—well, as comfortable as six frightened people squeezed into a metal cage in the middle of the ocean can be, of course. The crew would toss out a piece of fish on a long rope and then, when they saw a shark getting closer to the cage, yell out "Divers down!" This was our cue to grab the regulator attached to the roof of the cage, put it in our mouth, and duck down a few feet below the surface for a prime view of the shark as he circled. The regulators meant we could breathe for as long as we wanted underwater—you didn't have to have any specific diving training, but I was certainly a lot more relaxed having used one before—then pop up to the surface if we needed a break. The whole time, we had to grip onto the bars with our hands and feet, treading water a little to stay afloat. All in all, we were in the cage about fifteen minutes and had four or five shark "swim-bys." The visibility underwater wasn't great, honestly—it was almost scarier to watch the whole thing from above—but when the shark swam by the cage, you just got this incredible sense of movement and scale. The biggest guys were about twelve feet long, and seeing something that large glide by a few inches from your face—even if it's just a bulky blur, which it mostly was—is a pretty crazy feeling. All that said, it really wasn't that scary. I know that sounds insane—hell, just looking at these photos again is making me break out the smelling salts; THEIR BEADY EYES ARE BLACK AS THE NIGHT—but in the moment, I really wasn't that frightened. I thought I would be, but I wasn't. Instead, I just felt very safe; the cage was sturdy, the crew was experienced, and none of my fellow divers came back to the surface with a bloody stump where a limb had been, which was kind of a bonus. I'd absolutely do it again, which is more than I can say for skydiving. On the way back to shore, however, it was so windy that I fell off the top deck of the boat—luckily only landing on a very confused guy below and ripping the knee of my jeans, rather than into the ice-cold ocean and ripping my arm from my body—and had to be forcibly held in place by Sean until the boat stopped and I could clamber down to a lower, lessy windy deck. I slept all the way back to Hermanus—where we had a picnic on the cliffs and maaaaaybe kind of saw some whales, if we squinted hard enough—and then all the way back to Cape Town, being dragged under by a drowsiness which I can only assume was borne of equal parts adrenaline crash and off-brand dramamine. And now I have officially been cage diving with great white sharks, which is a cocktail party ice-breaker if ever I've heard one. If you are interested, there are a few more pictures of Hermanus and Gansbaai here, though you may wish to view several of them through squinched-up eyes. Oh wait, I guess maybe I should have put that disclaimer at the beginning of the post, huh? Sorry about that. Hope you're not going near any large bodies of water anytime soon. Or baths. Or showers. My husband has seen Jaws a few too many times and I would never be able to do that. I would like to, but he would have a panic attack of massive proportions if I even mentioned it. You two are big BADASSES. One day your kids and their friends will think you are cool. Wow you guys are adventurous as I strive to be some day. This sounds amazing. What an amazing experience. You are very brave! I went whale watching in Iceland, and was so violently seasick, I threw up over the side of the boat four times. And we didn't even see any bloody whales! What death defying stunt is next on your to do list?! THIS IS AMAZING. I still can't believe you went for it. I remain on the fence. I think it's the being stuck in a cage thing. What if, god forbid, you ran out of air? How would you get to the surface? Also I love how this post was like: SHARKS! BLOOD-THIRSTY SHARKS! Oh, wait. Let me tell you about my lovely B&B first. MORE SHARKS. You're a badass, Holly. Seriously. I was so excited to see this in my RSS feed! I've been waiting for this story since I saw the photos! OK, getting up at or before the crack of dawn in order to jump into icy ocean waters, not to mention choppy nausea-inducing ones, in order to party with the sharks? SO high up on my list of things I am delighted that Bold Blogger Holly has already done so that I won't ever have to!!! Bless you, a thousand times over, for your intrepid nature, and your way with words. Truly, "taking us with you" on these adventures? Priceless -- and greatly appreciated! Let me just take a moment between all the talk of sharks, your state of badassness, and... sharks, to focus on something girly and completely shallow. You look amazing with long hair. The person hanging off the side of the boat, vomiting into the ocean (and then thinking that I was most likely going to die by being eaten by a shark in a pool of my semi-digested breakfast)? Yes, that was me. The water was so rough the day we went that despite also being doped up on Wal-dram, I (and every single other female on the boat) spent the majority of the trip hanging overboard, getting sick. One woman was able to get in the cage; she would get in, get out and get sick, and then get back in. But the rest of us never actually made it in the water. Your pictures are amazing as usual. I only managed a few blurry shots of what may as well have been big greyish fish. My mind went blank after the photo of Savanna Dry. Savanna Dry is one of the things I miss most about Africa. Marcheline, thank you! I've been despairing of it lately and wanting to cut it all off, so your comment was especially lovely. Katie, the pics are mostly Sean's, but I shall pass the compliment along. Thank you! This is my first time commenting and I know this was a few months ago but I just have to tell you a few things. I LOVE your blog! You're so funny and I relate in so many ways. Second, I am SO jealous that you went to SA and went cage-diving with great whites!!! I have always wanted to do this. I am so obsessed with great whites and would love to see one. Third, I don't know if you are aware of this but San Francisco actually has a lot of great white sharks in the area. There's a book I'm reading called The Devil's Teeth about great white sharks that live near these islands called the Farallon Islands off the coast of San Francisco. I bet you could go see great whites in your own backyard if you wanted to.